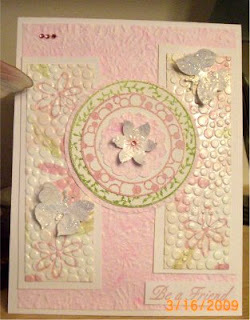 For this card I applied clear drying glue, glitter & crumpled tissue, when dry I stamped on the acetate, colored on the backside (tissue) with Copics & mounted. 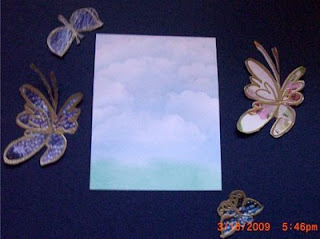 I used a light blue glitter which reminded me of clouds when it was all dry. I've had these well inked stamps for about 10 years but haven't used them in a very long time. 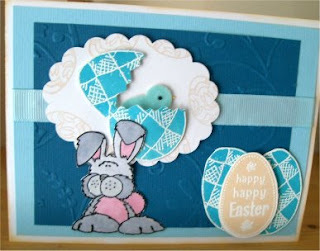 I made my second Easter card pretty much the same as my first but different colors & I had to add this cute little bunny I got as a freebe with my High Hope stamp order. This one is part of a set from TAC, isn't he adorable. I messed up coloring the little guy with my Copics & wasn't able to fix him, so, stamped another one & 3'd him & added Glossy Accents. I was only going to put 2 photo corners on but wasn't paying attention & had stuck 2 to the bottom, that's why there are 4 now. After punching the bottom it didn't look right to my eyes so I decided to add the strip as well & a lighter blue under it. I colored the ribbon with my Copics. With all my goofs I ended up liking this one. I made a stamp pad with paper towels & bleach, stamped on black cs, it didn't lighten as much as it did when using a brush but the odor was getting to me so I wanted to work quickly. I was "painting" with bleach on dark brown cs, it's fun if you can stand the smell, you just never know what'll you'll come up with. 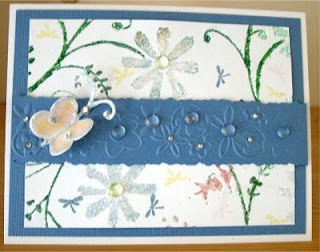 I added glossy accents & glitter around the border after bleaching that as well. 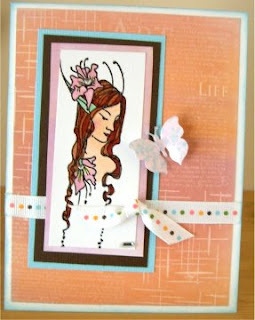 This was a cute idea I got from watching one of Dawn's videos, at Dawn's Stamping Studio, you can find her blog on my sidebar. A hidden message card, fast, cute & simple, with the help of a brad. 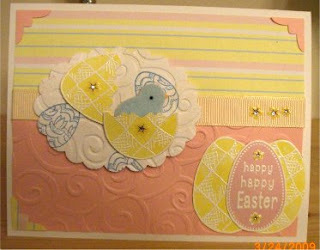 My first Easter card of this season. I love the idea of stamping an egg, cutting it to make it look cracked with a lil chick popping out. I wish I could say this was my idea but I got it from the Hero Arts Blog but this is my interpetation. 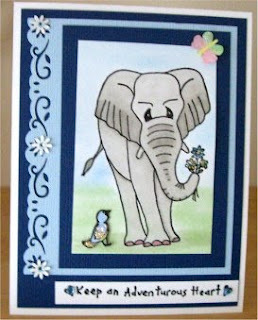 This is still more of my Think Big set from Artful Inkables - I just love this set. I'm not thrilled with this card but since it's all I'v made in the past few days I thoght I'd post it anyway. 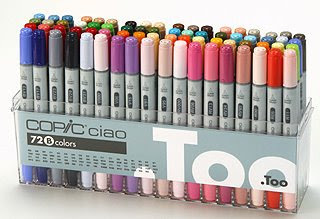 Oh can you just imagine winning these, I'd be thrilled. You can check it out here for your chance to win, good luck. You have till April 12/09 to enter. 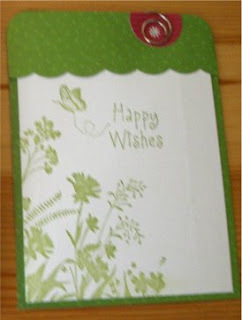 Looking for a chance to win some great blog candy, well don't wait, check it out here & good luck. 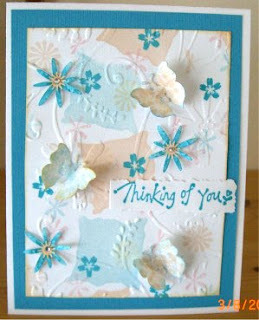 I just had to share this card I received from a very talented friend of mine, is this not too gorgeous. 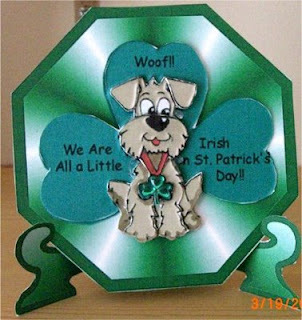 I just love everything about it, that little dog is so darling, he is composed of many layers but I don't think they show in the picture. 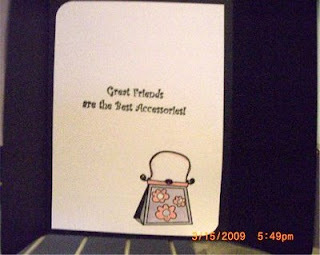 It is called a Plate card, first one I ever received & it gave me the biggest smile. Thank you Carrie. 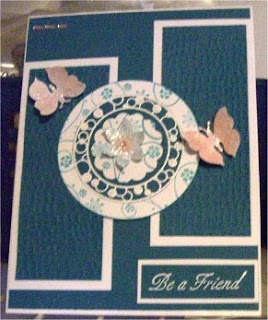 If you'd like to check out some of her other creations just click here. When I first saw this stamp it was a MUST HAVE, I just love it. 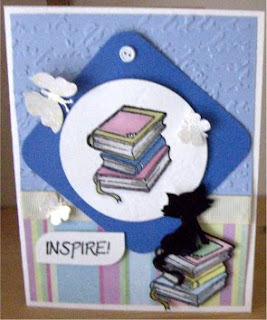 It's one of the new sets from Artful Inkables, comes with the cat, a stack of 3 books & some very nice sayings. I didn't position her well the first stamping & she looked like she was about to tilt over, so, I decided to cut her out, mount her on the blue after I ran it through my cuttlebug. The cats placement was a no brainer, his ear is covering my little blob on her elbow. 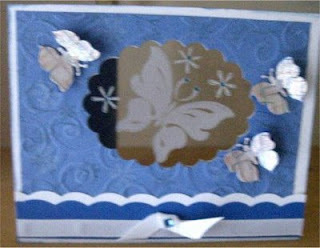 I think this is one of my few cards without a butterfly or glitter but I did add glossy accents to various places. Ok, I've been tagged & the rules are to go to where I store my pics on the computer, pic the 4th pic of the 4th album, post share & tag 4 more. 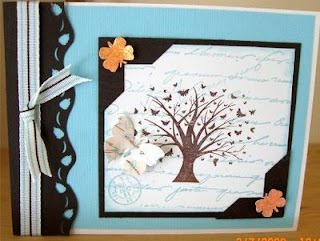 This pic is from a class with an online group of card makers I belong to. 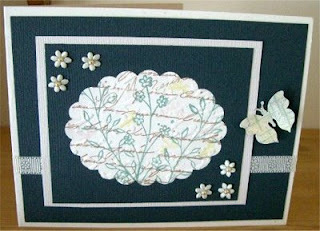 This was my first attempt to make clouds using a sponge, ink & scallop scrap. We were also learning the cloissone technique, if I spelled that right cause I sure can't pronounce it right. This is where you stamp with versa mark on a magazine cover, or calendar & emboss in gold. Then we post our versions to the group so we can compare. Now I 'm off to tag 4. This was an idea I had to try & was happy it came from my mind to paper pretty well. I used my scallop oval punch, sandwhiched the acetate, stamped on it with white Staz On ink. 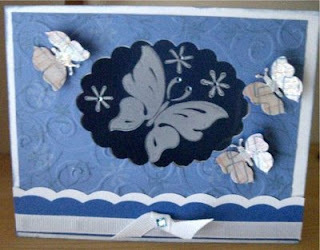 The butterfly didn't show too well as you can see in the lower pic, so I layered a darker blue to the inside of the card. My good friend Dee let me borrow this darling set from SU, playing around with it yesterday this is what I've come up with so far. 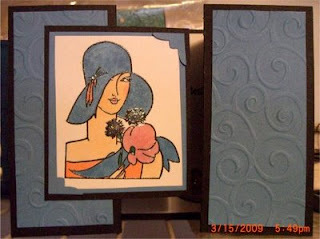 I used a scallop punch, sponge & ink to make a quick background on glossy cs. I couldn't resist, I had to color the fire hydrant pink & pink isn't even one of my favorite colors. I just love the look on the dog's face. 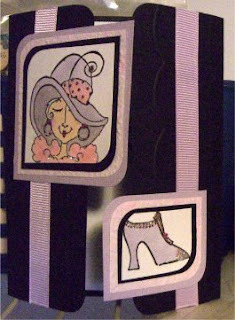 This is another sketch card I did for a swap, I did the strips on glossy cs, stamped, brayered & layered with some Japanese paper, the circles were stamped with a set from TAC. Hey, looking for a chance to win some awesome blog candy, well, check it out here. Cindy is celebrating her one year of blogging & she just signed up as a SU Demo in Canada. 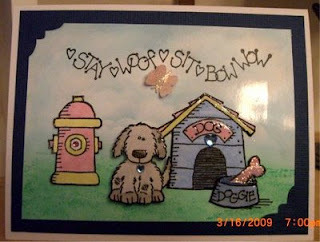 So pop on over, congratulate her & check out her blog for some inspiration as well, she is very creative. 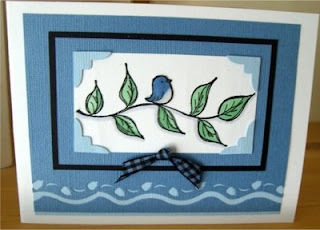 If you're looking for some Stampin' Up products here is her link. I did this for a sketch swap I joined & kind of like the look of it. 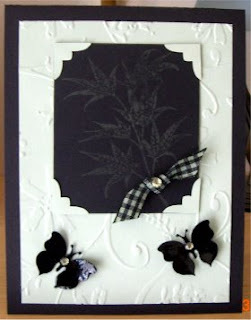 I found this gate fold on Dawn's blog & had to try it out, you can see it open & closed. I do like this fold. I do like the attitude of this woman. This too is called a gate fold but with less scoring. 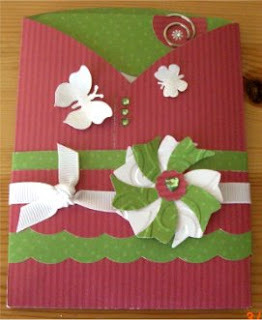 This was just an idea that popped into my head when I was playing around & I had so much fun making this card. 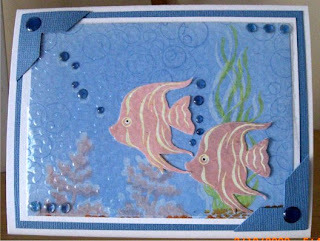 First I stamped the background with resist, brayerd over it with Stonewash, restamped with my chalk inks for some color, stamped, cut & placed the fish. 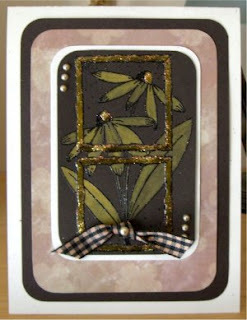 I embossed the acetate with my cuttlebug for a glass like effect, a little layering, I'm done. The stamps are from TAC, circles in the background are a Judikins cube. I saw this technique done on one of Dawn's videos, looked so fun I had to give it a try, even used her colors of choice since they are so pretty. You can check out her video here for the complete instructions. My first try at this trifold, I think it's neat to have the message tucked inside. It was rather easy once I got the hang of it. 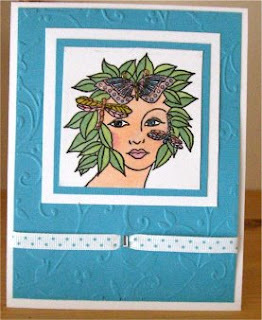 I've been using stamps that I haven't used in a while such as my shadow stamps & mixed them with some of my newer ones to create the background, then ran it through my cuttlebug. I'm also stamping on my punches & running they through the cuttlebug just to play, experiment & see what I can come up with. 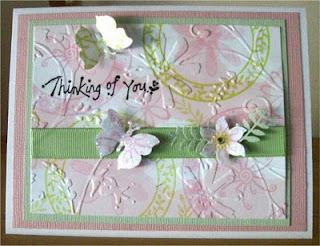 This time I stamped my script with beige, overstamped flowers & leaves with various colors, some layering, a punch & I'm done. 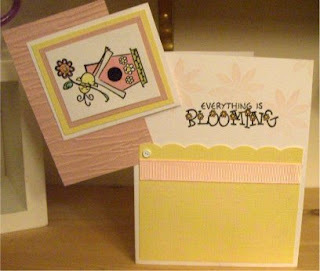 I've joined the Sisterhood of the Blogging Stampers. I'm so looking forward to being a part of this group of talented people. 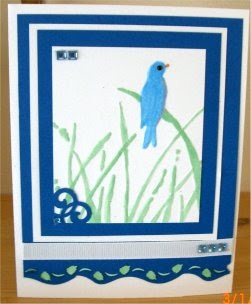 I'm a retired stamp-a-holic which is so fun as I get to spend a lot of my time stamping & trying new techniques. I am into my 15th year of this wonderful addiction & it is still my number 1 passion in the creative world. I live in a small town, Hope, BC, Canada, surrounded by mountains & rivers, being a nature lover this is my perfect place. I live with my life partner of almost 30 years, he is very supportive of what I do, 2 dogs & 3 felines (my furry babies). I've been blogging for almost a year & enjoy the inspiration I receive visiting sooo many blogs out there. Looking forward to meeting the sisters here. Well now I'm off to do some blog posting. I've been playing with resist, glossy paper & my brayer making backgrounds. I forgot how fun these are to do, I get to ink more of my stamps with this techniuque rather than having them sit on the shelf collecting dust. If you feel a little tilted looking at this one, it's not you, I really didn't get my layering very straight but I like the colors. I wanted to put my new ribbon to use so that's how I chose these colors & I've missed using my script stamps. I've had this lady for quite some time, wanted to color her with my Copics & here she is. 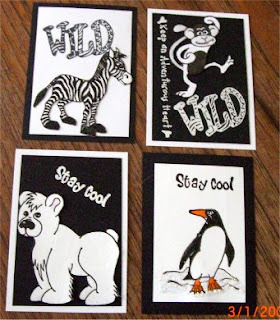 These were done for a Black & White ATC swap, very fun & easy to do. 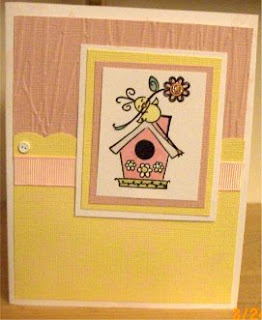 Another cute stamp from Artful Inkables, the little bird is from High Hopes. I saw this technique here at the Cuttlebug Challenge Blogspot & had to give it a try. I used a glue pen to make the debossed areas tacky, then sprinkled glitter over it & burnished with my finger. They suggest using fine glitter but the only fine one I have is the one I used for the flowers, as you can see the green glitter was thicker & didn't lay very smoothly, now I know why they suggest FINE. 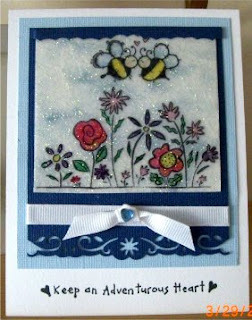 I forgot how much glitter flies everywhere & it is everywhere, still I had fun giving it a try. Yesterday I was just playing around with my cuttlebug to see what I would come up with. I decided to be brave & color the fine embossed area with my copics.